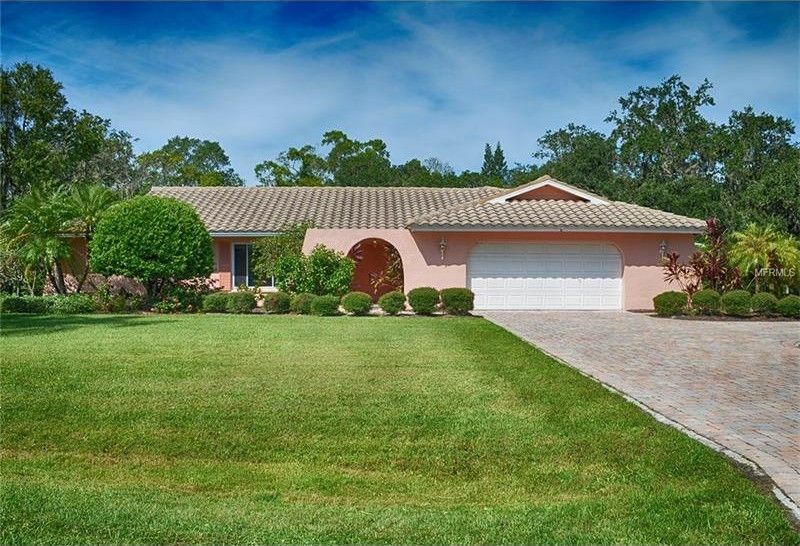 This Lovingly cared for POOL home on an ESTATE SIZED LOT, located in an enclave of CUSTOM homes, is ready for IMMEDIATE OCCUPANCY. UPDATED KITCHEN with high end Granite, Wood Cabinetry and Stainless Steel Appliances with ABUNDANT STORAGE. An ENORMOUS LAUNDRY ROOM with ADDITIONAL PANTRY and Storage, Closets and Folding Table and Sink sits adjacent to the kitchen. The family room has a WOOD BURNING FIREPLACE that is unique in design with a Beautiful Stone Wall Accenting the room along with CATHEDRAL CEILINGS . The office is on the same side of the house as the master bedroom. The Guest Bedrooms are GENEROUSLY sized. NEW VANITIES in bathrooms. The house surrounds the Pool and the GROUNDS are BEAUTIFULLY MAINTAINED. There is a pond beyond the pool that could be a focal point for entertaining. A WORKSHOP/SHED IS AIR CONDITIONED . The OVERSIZED 2 Car GARAGE also has a WORKBENCH inside. The house had a Newer Barrel Tile Roof installed in 2003, the Air Conditioning is 2014, a New Electric Panel was installed 2016. NO DEED RESTRICTIONS. Driving Directions: Bahia Vista Street east of Beneva Road. Left on Bahia Vista Court to #1060.